In Books Tagged In Canada, Civil Liberties Denied, FLQ, October 1970, Paul Rose, Quebec, Trudeau, and War Measures. Forty-three years ago in the middle of the night the government of Pierre Elliott Trudeau proclaimed the War Measures Act following two political kidnappings by the FLQ. It thereby suspended the Constitution and all civil liberties, deployed 12,500 troops in Quebec—7,500 in Montreal alone— arrested 465 people without charges and detained them incommunicado without bail and without the right to legal assistance. It also entered and searched more than 10,000 homes without warrant. 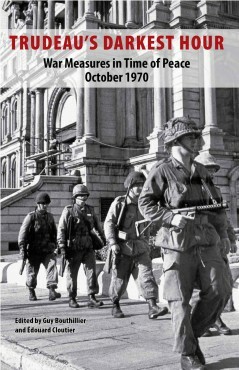 In this rigourously researched and brilliantly presented anthology, Canadian political leaders, thinkers, journalists, and writers explain how the government of Pierre Elliott Trudeau deceived the people of Canada and denied justice when it proclaimed war measures in peacetime for the first time in history. Tommy Douglas called it “overkill on a gargantuan scale.” Trudeau’s own ministers Don Jamieson and Eric Kierans said their case was not “compelling,” that they made a “terrible mistake,” and that their “common sense went out the window.” Peter C. Newman tells how Trudeau floated a “meticulously concocted lie” about a revolutionary provisional government in Quebec. Margaret Atwood, Robert Fulford, Robert Stanfield, Reg Whitaker, Jack Granatstein, John Conway, Thomas Berger, Ramsay Cook, Desmond Morton, Hugh Segal, David Macdonald, and others provide testimony, insight, and wisdom to understand the past and guide us in the future. Trudeau’s Darkest Hour is dedicated to the memory of Tommy Douglas. “He showed political courage of the highest order,” wrote Eric Kierans. “I was delighted that someone finally had the courage to tell the truth: that Pierre Trudeau and Marc Lalonde both lied to me about why the War Measures Act was imposed– but it took 40 years before the facts were published. This is a compelling and essential book.” Peter C. Newman. Guy Bouthillier holds a law degree from McGill University and a PhD from the Sorbonne (Paris). He is honorary professor of political science at the Université de Montréal where he taught for thirty years. Édouard Cloutier holds a PhD from Rochester University, New York. He taught political science at the Université du Québec à Montréal, McGill University, and the Université de Montréal where he chaired the Political Science Department for many years. He has chaired the Société Québécoise de science politique and co-directed the Canadian Political Science Review.